Country-style getaway, this renovated home is just out of the busyness and ready for you to relax after your fun adventures. Equipped with WiFi, hot tub and a fireplace. Looking for a country style get-a-way, or a fly fishing get away, come visit Tight Lines. With a half a mile of Rock Creek frontage, you simply can't beat this opportunity for fishing for rainbow, brown and brook trout! 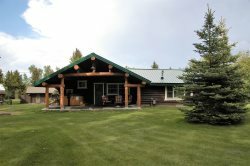 This is a great property for cross country skiing and wildlife viewing! Grab your friends and family and stay in this tastefully decorated home that sits on 35 acres and offers much peace and quiet. Take a soak in the hot tub and listen to nature. Two miles north of Red Lodge, this vacation home will help you leave the stresses of everyday life behind. Enjoy a creek side meadow that is great for Frisbee and picnics. Just a bit down the county road you will find two fishing access points open to the public. Tight Lines has a master suite upstairs with a queen bed and full bath. The other bedroom upstairs has 3 twin beds. There is also a 3/4 bath and laundry facilities on this level. On the main level, there is a bedroom with a queen bed, a den with a queen sized pull out sleeper sofa, a full bath kitchen, dining and living areas. All encounters with staff have been positive. Very helpful and professional in their duties. Wished we could stay longer there. The place is immaculate. Member we're very nice and answered all of our questions. It is a lovely setting. We enjoyed ourselves very much. The house was perfectly equipped. It was clean, beautifully decorated, the beds had nice linens and there was plenty of space for our family to enjoy together. We loved it! "A beautiful, relaxing getaway My siblings and I had an outstanding stay at Tight Lines in Red Lodge. I had never been to the area, and had no idea what to expect. The town of Red Lodge itself is so charming. They have everything you might need within a short distance, not to mention it is flanked by stunning snow-capped mountains. The house was perfect for our needs. There was plenty of room for all 5 of us to sleep comfortably. The house is so tastefully decorated and clean. It had everything we needed. Only wish we could have stayed longer. " "Red Lodge..our Home away from Home!! Aaa rentals and Piney were very helpful! We loved the home, very close to town(2 miles)but in a very secluded setting. Only changes I would suggest, a couple of adirondack chairs on the front porch for coffee in the morning! We loved the deck and hot tub, and after a day of hiking it felt great to come Home and relax! Also, there is no Wifi or cable(if thats important to you) but we didn't mind. The bathrooms/bedrooms everything was clean and comfortable. Overall, the accommodations were wonderful! This town was the perfect gateway into Yellowstone with a fantastic drive along the Beartooth Highway. Lots to do in this small town also, great restaurants and shopping. We Loved Red Lodge! And will return to this town and this property! " "Top Notch accommodations. Service from aAa rentals was excellent. Directions were excellent. If we could recommend one thing it would be to put a side light on the address or a street light. We drove 9 hours and it was our first time to the area. It was hard to locate the address. House was amazing. Bathroom/showers were like new and clean. Natural gas fireplace was excellent. Hot tub was clean and well maintained. Hot tub technician was curtious and polite. The beds/bedding was clean and comfortable. " "great house, lots of space, just outside of town This is a very nice house for a group. the bedrooms are kind of spread out, so it's quiet upstairs even if people are still hanging out in the kitchen. the porch and hot tub are nice too. the main room is huge and was great for us to sit in and relax. We didn't use the 'den' pull out bed, but the rest of the beds were nice and comfortable mattress. " "Perfect winter getaway! Tight Lines was the ideal place for our family getaway. The home is beautifully and comfortably furnished. Well stocked kitchen. Great location - snowshoeing right out the door! We appreciated the fact that the driveway was plowed twice while we were there. Would definitely return. " "Relaxing and Fun Tight Lines was the perfect cabin for the weekend getaway with enough room for everyone. It was quiet and remote to really make it cozy. I would recommend this place to anyone and would go back to it soon! " "Peaceful and Relaxing setting Very peaceful quiet setting. We loved how the house was decorated - cozy and relaxing atmosphere. There was plenty of room for the 5 of us. We liked being out of town. Wish we could have stayed longer. " "Great experience at Tight Line Rental was very roomy, clean, comfortable and perfect getaway for weekend. We will stay here again.. "
"Perfection My husband, two kids and I stayed here for a week. It was absolute perfection. I wouldn't change a thing-- location, house layout, or decor. We enjoyed the hot tub every night, and saw deer on the property daily. It is a two minute drive to Red Lodge, the most charming town in the world. We can't wait to come back and stay here next year. But we learned our lesson... next year we are staying two weeks! " "Relaxing It was quite and beautiful! The house was VERY clean and nicely updated! You felt like you were way out of town but it was nice you could run into town (only 2 miles) to grab something. " "Comfortable, luxory We had a small family reunion with 2 boys and a baby and were very comfortable. The kitchen had everything we needed for cooking. There were ample towels, bedding and pillows. The back/front yard was perfect for the kids to run around in. And the hot tub was lovely under the stars at night. The location is a close drive or perhaps bike ride to Red Lodge, but not in the town. The only negative for us was that we couldn't find coasters for our drinks and were concerned about leaving rings on all the fine food furniture. Not bad as far as complaints go in my book:) "
"We all wanted to stay longer! What a great place, by far the best rental we've had. Spotless inside and out, decorated and furnished beautifully, linens and towels were top notch, well stocked kitchen, great yard. I don't know what else we could have asked for. Piney and Jenn were terrific to work with, we would absolutely stay again! " "Perfect retreat! This house was so cute and comfortable! We loved it, and wished we could have stayed longer (probably would have if there was wifi for business purposes). It's in a beautiful setting, and just outside Red Lodge, which is such a cute little town. So refreshing for a getaway from the city! " "Very nice home in all respects. The rental agency was helpful and accomodating - we arrived earlier than we expected and they were able and willing to allow us access well before the normal check in time. That small allowance added a lot to our weekend. The home itself was in very good shape and had all the amenities you might expect. Wifi would be nice, but with smartphones we got as much internet access as we needed. The location was a little remote, but still had easy access to town and about a 20-25 minute drive to the parking lots on the mountain. All in all our family of 7 was comfortable and happy the whole weekend. " "A great house for a ski weekend in Red Lodge! The house was perfect for our group of 9 people. It is 3 blocks or so from downtown and would be a beautiful place to stay in the summer because it is close to the river. There is a cabin in the back with a Queen bed and a bathroom. It is the most lovely little cabin with a very comfortable bed!! The kitchen was stocked with anything we could need and the house was clean. Enjoy! "